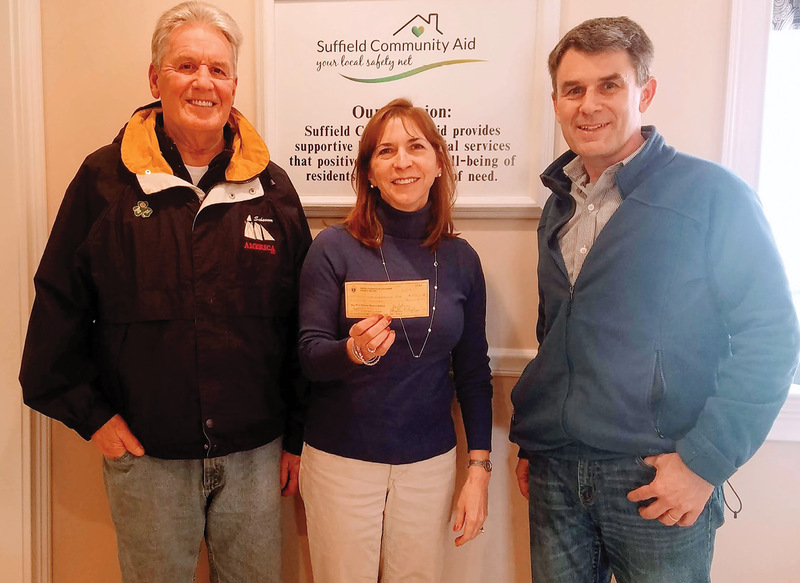 Two local organizations team up to donate to Suffield Community Aid. Holding the check is Janet Frechette of SCA; at the left is Jim Hunter of Landry Sic VFW, Post 9544; at the right is Grand Knight Mike Voisine of the Suffield Knights of Columbus, Council 6281. Scam Alert: Beware What You Share! Identity thefts and scams are rampant in Suffield. The Suffield Police report that they receive calls concerning identity theft and scams daily! It is important to know that the victims of these attacks are not just the elderly. We are all potential victims! In an effort to warn Suffield residents of what the current scams and identity thefts are, several community groups are banding together to spread the word. Attend one of the sessions to learn how to protect yourself and others. Suffield Police Lt. Ryan Burrell will describe various scams and teach people how to identify them, and what to do. Handouts will be provided at each meeting. Are Meals-on-Wheels an Option for You? Qualified homebound seniors, age 60 and over, living in Suffield can receive healthy lunches and dinners delivered to their door. Meals are balanced, nutritious and diet specific. A $2.50 donation per meal is suggested by the CRT to help cover costs. Contact SCA! The group meets the last Tuesday of each month at 450 South Street, Suffield at 11 a.m. The next meeting is Tuesday, April 29. You do not need to be a resident of Suffield to attend. The group is led by a trained Alzheimer’s Association facilitator, Nicole Matson of Home Helpers of Central CT. Call SCA at 860-668-1986 for more info. Come share ideas and resources in the management and treatment of Parkinson’s disorder. The next meeting is April 8 from 11:30 – 12:30. Caregivers are welcome and encouraged to attend. Topics vary monthly. Refreshments/lunch are served. For more information or to RSVP, call Janet at SCA – 860-668-1986. James F. Coggins, Jr. Community Service Award- Open to Applicants! In memory of our late volunteer and Board Member, James F. Coggins, Jr., SCA offers a $1,000 award to a graduating Suffield High School senior who demonstrates selflessness, generosity and concern for the community through their volunteer activities. Applicants are required to submit a 500–word essay supporting their selection to SCA at 450 South Street, Suffield 06078 or email to janetf@suffieldcommunityaid.org. The deadline to apply is midnight on Monday, May 13. To recognize the many contributions of our past employee and long–time supporter of Suffield Community Aid, the Board of Directors dedicates an annual needs-based scholarship in memory of Jane Purtill Fuller. This scholarship will be awarded to a graduating Suffield High School senior pursuing a nursing or social service field of study. Applicants wishing to apply are encouraged to fill out the common application at the Suffield High School or call SCA at 860-668-1986. The application deadline is May 13. Having Trouble Affording Summer Camp for your Children? SCA has funding available to subsidize participation for eligible Suffield children and youth attending Suffield Park & Rec. and other camp programs. For more information or to apply, give us a call! Operation Fuel partners with more than 100 agencies across the state to provide low–income families with year–round emergency energy assistance. SCA is a partner agency to the Operation Fuel. Assistance can be provided with any energy type: oil, electric, natural gas, kerosene, wood, propane, pellets, and other energy sources. Call SCA or go to www.operationfuel.org for more info.